Eating a handful of strawberries a day could help millions of people cope with inflammatory bowel disease. A study on mice has discovered eating just a few whole strawberries every day could reduce inflammation in the colon, weight loss, and diarrhoea containing blood. The test was aimed at helping people with inflammatory bowel disease, which includes Crohn's disease and ulcerative colitis. The condition is thought to affect some three million Americans, over 300,000 people in the UK and 85,000 Australians. Strawberries restore a healthy balance of bacteria in the gut as well as reducing symptoms in mice with the incurable diseases, the research found. Experts from the University of Massachusetts say eating strawberries could help people manage the conditions, which they say are worsened by modern inactive lifestyles and diets high in sugar and fat. Inflammatory bowel disease (IBD) is a term mainly used to describe ulcerative colitis and Crohn's disease - long-term conditions which cause inflammation in the gut. Patients are usually treated with symptom-reducing medication or surgery, but changes to the diet can be important in managing the conditions. Now researchers believe simply eating strawberries every day could improve patients' gut health. Eating fruit and vegetables has already been linked to a lowered risk of IBD, but Professor Xiao and his team focused on strawberries because of their popularity. They found just 250g of strawberries per day for a person with IBD could be enough to reduce weight loss or diarrhoea, and to reduce inflammation in tissue in the colon. Another effect of IBD is an increase in harmful bacteria in the colon, which reduces the amount of healthy bacteria. However, the University of Massachusetts study found eating strawberries reduces this bad bacteria level and restores a healthy balance. 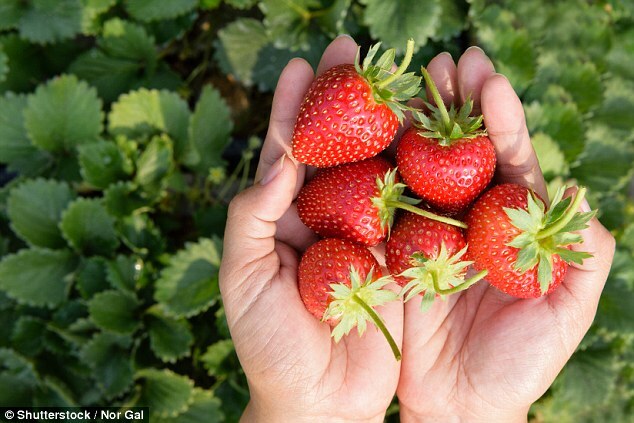 Yanhui Han, a PhD student who conducted the study, says most previous reports have focused on the effects of purified compounds and extracts from strawberries. He added that it also makes sense to study the effects of whole berries because people mostly consume the whole fruits rather than their extracts. In their experiment, Mr Han and Professor Xiao used four groups of mice. They used a group of healthy mice consuming a regular diet, and three groups of mice with IBD consuming a regular diet, a diet with 2.5 per cent whole strawberry powder or a diet with five per cent whole strawberry powder. The researchers tried to feed the mice doses of strawberries which would be in line with what a human could eat. Sick mice which consumed the equivalent of around 250g of strawberries for a human saw their symptoms improve. The team, who are due to present their findings at the National Meeting of the American Chemical Society (ACS) in Boston, now plan to test the effects on human patients.